For many motorcyclists, group riding is a regular event. It's something most riders look forward to throughout the year. 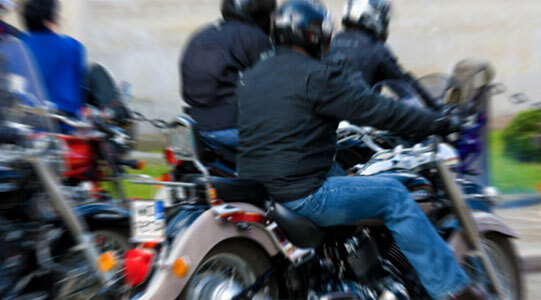 Whether you're cruising across the country with friends or riding in a pack for a motorcycle rally, it's important to stay safe while riding in a group. However, we know that sometimes accidents happen. If you've been injured in a motorcycle accident, we can help get you money for your injuries. We're standing by, and we'll help get your life back on track. Our legal professionals will review your case for free and answer any questions you have. Call us at 1-866-943-3427 or simply fill out our free legal consultation in the top right corner of this page. Here are some things to remember when organizing or participating in a group motorcycle ride. Be Organized – Pick a place to meet up before the ride. You'll be able to decide where your stops will be, which routes to take, and you can exchange cell phone numbers. Be Smart – Just because you're with a group, doesn't mean you should change the way you make safe decisions. Never ride faster than what makes you comfortable and never sacrifice your personal safety. Always Communicate – Make sure everyone knows the proper hand signals. Trust Experience – Seasoned riders should always be in the front and back of the group. Put novice riders near the experienced ones, so that the pace can be adjusted to where everyone is comfortable. Leave Room – Make sure that there's at least a 2-second cushion in front and behind you at all times. To keep your group tighter, consider staggering your formation. Always Adapt – If you find that visibility decreases, or you are heading into a series of tight curves, drop back to a single file formation. This allows everyone the space cushion they need. Buddy System – If you have a large group of riders, consider splitting into smaller packs of 5 to 7 motorcycles. It will be easier to keep everyone on track and make sure that no one is left behind. Communication is key when you're riding with a big group. Here are some hand signals, as well as other great information, you can share with your group. This way, everyone will know exactly how to communicate with each other. Print them out and pass them around at your next motorcycle meet-up. We want you to stay safe when you're out cruising – whether you're with a group or riding alone – and these hand signals can help. We know that even the safest riders can have accidents. If you've been injured in a motorcycle accident, call us today. We'll help you figure out your best options, and we'll review your case for free. Call the law firm that cares about bikers at 1-866-943-3427 or simply fill out our free online legal consultation in the top right corner. We'll fight to get you the money you deserve for your injuries. We'll cover your upfront costs, and you won't pay us a cent unless and until we win your case. That's our guarantee.